The Commodores and Boney M were riding high at the top of the charts, paramedics had not been introduced and ambulances still had bells. At 9o’clock on the morning of 11th September 1978 a young Yorkshireman reported for his first day of duty at the Leeds Central Ambulance Station. His friends told him he wouldn’t last long in the job, but forty years later and now in Guernsey, Andy Barrett is about to retire from the job he loves. After just one week of basic first aid training Andy’s ambulance career started with the Patient Transport Service, driving a ten-seater ambulance transferring people to and from hospital appointments. 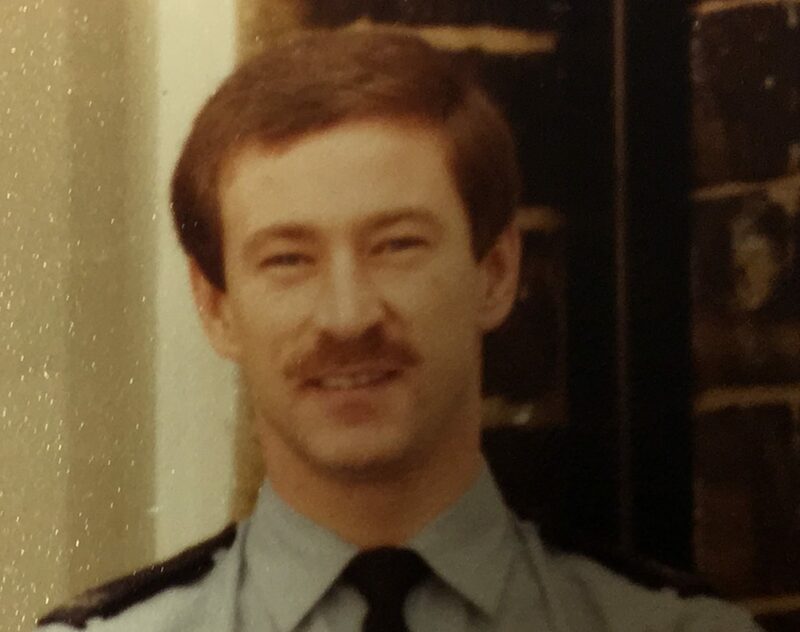 The following year Andy started his training to become an ‘Ambulance man’, as they were called in those days. Ambulance work in the 1970s was still fairly basic. It seems strange now, but in the early days of Andy’s career ambulance men had minimal driver training before they were able to respond to emergencies. It wasn’t until the 1980s that formal emergency driver training was introduced. Andy spent six weeks on a residential course at the Keithley training school and qualified in November 1979. He still has vivid memories of his first shift. It was a nightshift and Andy and his crew mate, Barry, were called to a road accident on the Leeds Ring Road involving a visiting rugby team from Australia. There were sixteen casualties and four fatalities. One job that did have an impact on Andy happened at a farm in Yorkshire, where a young girl had suffered multiple injuries. Despite the best efforts of the crew the patient died on the way to hospital. Andy solemnly as he recalled the events with grim clarity. In happier times during his forty year career Andy has delivered fifty-one babies. At least three of those babies where named after him, including Andi as a girl’s name. During the 1990s the profession of paramedics began to develop with enhanced training and greater clinical skills, allowing qualified ambulance staff to provide more advanced pre-hospital care. Andy was selected for the paramedic suitability course in 1995 and qualified as a paramedic on 6th June 1997. Before moving to Guernsey Andy was at the forefront of out-of-hospital emergency cardiac care in Yorkshire. He became a Cardiac Responder in the year 2000, with the ability to take a 12-lead ECG, showing the detailed workings of the heart, and provide advanced treatments which could previously only be done in hospital. He was the first Cardiac Responder in the county to thrombolyse, which involves administering a clot dissolving drug to patients having a heart attack. Andy also served on the Yorkshire Ambulance Cardiac Strategy Group and was given a commendation for his work on a project which saw ambulance staff visiting the relatives of patients who had died to check on their welfare after their loss. 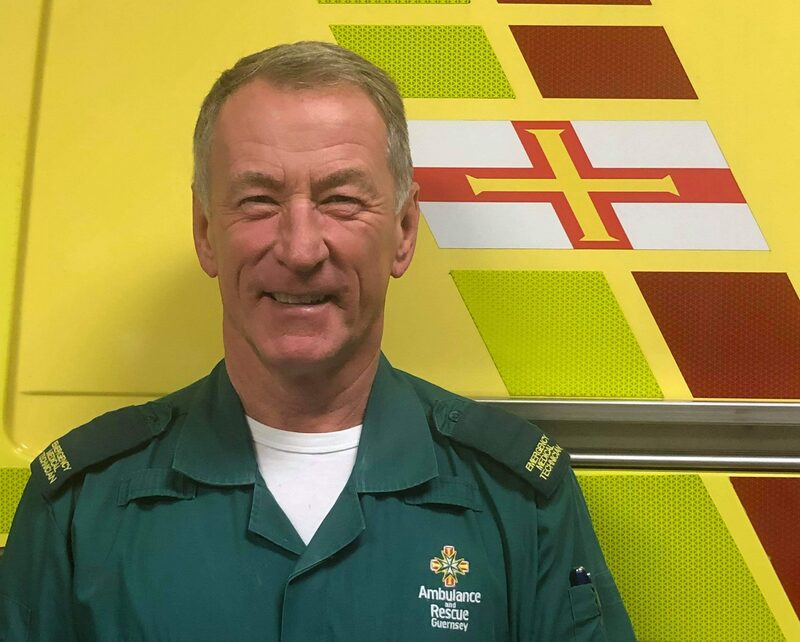 Andy moved to Guernsey in 2006 and joined the St John Ambulance & Rescue Service. He continued in the role of paramedic until four years ago when he decided to practice as an Emergency Medical Technician. “As I was nearing the end of my career, I thought it was time to step back and let the youngsters do all the difficult stuff.” he said with a smile. The ambulance profession has changed and developed over the past forty years, with the introduction of more enhanced clinical skills, advances in medical technology and a wider selection of drugs available to clinicians. Andy says his proudest moment was being presented with his Long Service Medal by the then Lieutenant Governor, Air Marshall Peter Walker. As he prepares for his final shift Andy says he will miss the people – patients and colleagues.